In a political climate that is fraught with problems, crises of leadership and legitimacy, one family foundation is driving a philanthropic effort that has no precedent in South Africa. By SHELAGH GASTROW. In a South African context which includes a huge decline of confidence, both by business and individual citizens that South Africa will prosper; where leadership and vision is sorely lacking; where our messages are negative wherever we look; where our currency is tumbling out of control; where corruption thrives unabated; where students are protesting, and where the demons of racism and divisiveness are rearing their ugly heads, a surprising piece of positive news flew recently across the bow of the listing ship South Africa. The news that a major new philanthropic foundation is being established by South Africans, Allan and Gill Gray, is somewhat astounding in its positivity. Essentially, after more than forty years of family control, the Gray family is giving away its entire controlling stake of the Allan Gray investment company and its offshore partner, Orbis, to the foundation. In a letter from Allan Gray to his clients, he announced that the family’s controlling interests in the Orbis and Allan Gray groups would be used to endow the Allan and Gill Gray Foundation in perpetuity. The total value of this endowment is currently unknown, but it will run into billions of rands, and is certainly to be the largest philanthropic foundation established by any South African in history. Philanthropy is almost always based on personal values and in this respect, the Allan and Gill Gray Foundation is no different. The letter indicates that the income from the shares will be “devoted entirely and exclusively to philanthropy” and that the family felt that this was “the right thing to do and a small but necessary contribution toward a society full of hope for all humanity”. The idea, in South Africa’s current crisis, that there is potentially a society full of hope for all humanity almost seems counter-intuitive. Gray goes on to state that rather than being a way of giving back to society, he believes that philanthropy is a natural extension of what the business does on a daily basis – that is to promote its clients’ financial security and peace of mind. The foundation will strive to make a positive contribution to the common good. Gray himself plans to spend his personal time on the new foundation and its activities. Critical to philanthropy is the concept of legacy and family values. Here, Allan and Gill Gray have clearly given thought to how this plays out. They recognise their children whose “enthusiastic participation and selflessness” made the foundation possible; as well as their descendants “who will be indispensable to the Foundation’s long term success”. The public letter has not specified the scope of the foundation – whether its philanthropy will be local or global, what its focus areas will be, what it will fund and what it will not fund. However, this major development is in line with the global philanthropic movement that has developed over the last decade, and shows that South Africans are giving thought to making a contribution towards a better world even beyond the borders of our own country. While some may differ with Gray’s view that the free enterprise system has done so much for so many, he believes that it “behoves those whom it rewards particularly well to help those less fortunate”. This is by no means Allan Gray’s first foray into philanthropy. In 1979 he established the Allan and Gill Gray Charitable Trust and in 2005 the Allan Gray Orbis Foundation which focusses on Southern Africa. The latter was established in the belief that “high impact responsible entrepreneurs will dramatically contribute to a positive economic, social and political change” and is funded by an annual donation of 7% of post-tax profits from Allan Gray Limited, which has committed to the foundation in perpetuity. It is backed up by an endowment trust capitalised by over R1 billion, which was donated by Allan Gray himself. The latter supports hundreds of young people with scholarships to attend high school or university. Those at university participate in a fellowship programme that includes leadership skills and entrepreneurial development whilst encouraging work experience. Funding is available for fellows who wish to undertake entrepreneurial activities and recently it was announced that six candidate Allan Gray fellows from the programme will be part of the Mandela Rhodes Scholar cohort in 2016. During this time they will undertake post-graduate studies and leadership development. In addition to the three initiatives outlined above, Gray established a Centre and a Chair in Values Based Leadership at UCT’s Graduate School of Business in association with the Allan Gray Orbis Foundation. He believed that the future and sustainability of the South African economy was dependent on sound, ethical and values based management and the centre focuses on “exploring new ways of doing business based on purpose, sustainability and responsible practices that create dignity and belonging”. 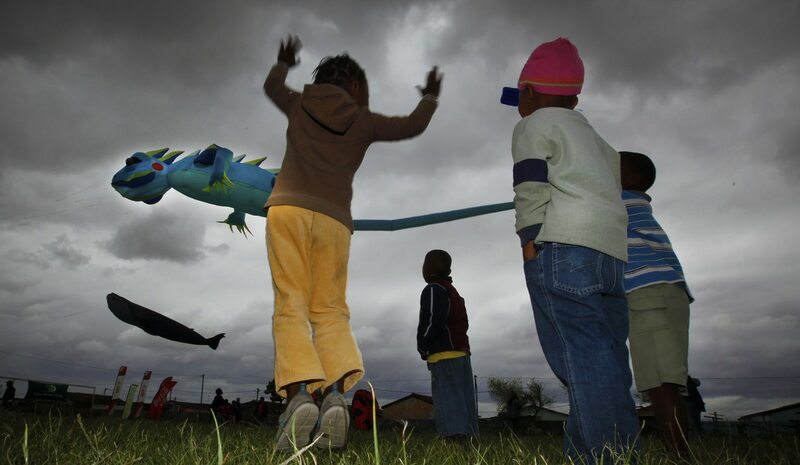 Photo: South African children from the Cape Mental Health Special Care centre fly kites as part of a special preview showcase for the Cape Town International Kite Festival in Khayelitsha, South Africa 21 October 2010. EPA/NIC BOTHMA.